"Why don't I have a multiplayer Fatal Frame yet?" asks Cliff Bleszinski. Why? WHY. Tell me why, Japan. Japanese gaming seems to have fallen by the wayside compared to the huge, multi-billion dollar juggernaut the western gaming industry has become. Some argue it's because Japanese game development culture has been stagnating for years, while others maintain it's because many talented Japanese developers have switched over to the handheld market in face of rising costs. Cliff Bleszinski, the mildly-grating, baby-faced visage of the Gears of War series, believes part of the problem is that Japanese developers are ignoring the current "big thing" in gaming: multiplayer. "And so my advice to Japan is that in a disc-based market right now, you cannot [ignore multiplayer]," he told Gamasutra. "I'm not saying tack multiplayer onto every game. But for instance, Shadows of the Damned, that was a wonderfully crazy adventure, the dialogue had me laughing out loud, just even the key-door systems in there; it was a beautifully crazy game with really fun gameplay, but no multiplayer co-op experience in there. I'm not saying tack on a versus mode; there's a billion different ways you can do some sort of "players interacting with other players" mode." I can't fault the man's taste. Shadows of the Damned was a beautiful, profoundly underrated game that didn't deserve the commercial clobbering it got. But was that down to a lack of a multiplayer mode, or simply because it was too weird for your average slackjaw? 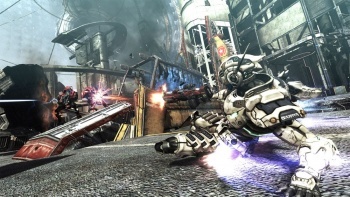 Bleszinski went on to single out Platinum Game's excellent Vanquish, pointing out its rather glaring lack of multiplayer features. "The fact that Vanquish didn't have a multiplayer suite was a crime," he said. "And whatever reason they had ... The road to hell is paved with good intentions. I'm sure the development team got together and was like, 'Well, we probably shouldn't do multiplayer because of the budget,' or the time, but at the end of the day you have an amazing product that was [handicapped] by the fact that it was seen by many gamers as a campaign rental or a used game, and not the $60, day one, gotta have it game." The idea that single-player-only games are rental fodder isn't particularly new. In fact, it seems to be that exact line of thought which is driving a number of developers to implement multiplayer features into single-player games that, according to popular opinion, really don't need them. "So that's my initial, just-off-the cuff advice that I would give, because I love all things Japan," he said. "Growing up I realized everything I loved was derived from Japan, from Transformers to Nintendo to Force Five, Mazinger and Voltron, and all of it. So I don't want those games to go away."